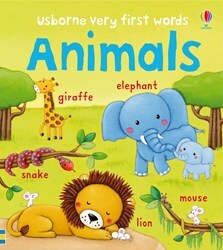 A colourful and charmingly illustrated board book, filled with familiar animals for little children to spot and name. A chunky, beautifully illustrated boardbook, this provides lots for little children to look at and talk about as they find out about animals. Encourage your child's first words and animal recognition with the colourful and lively pictures in this chunky first word book... The illustrations are quite charming and perfectly pitched for the age group.